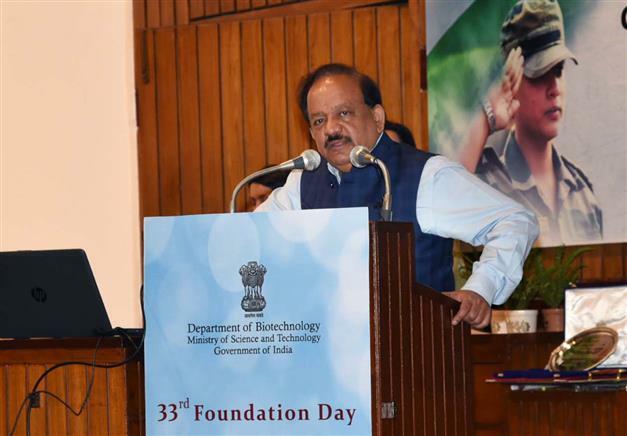 New Delhi: Department of Biotechnology in the Ministry of Science and Technology, Government of India, celebrated its 33rd Foundation Day today in New Delhi with the theme as “Celebrating Biotechnology: Building Indian as an Innovation Nation”. 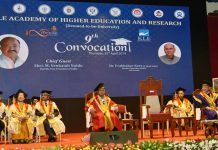 On the occasion Union Minister for Science & Technology, Dr. Harsh Vardhan gave away the Biotechnology Research Innovation and Technology Excellence (BRITE) awards. The Union Minister emphasized the role of Department of Biotechnology during the last 33 years in creating a large scale impact across the multiple sectors by development and commercialization of affordable solutions for healthcare, improved crop varieties, animal diagnostics and technology for generation of clean energy. Further, he highlighted the progress made in the area of capacity building, generation of new knowledge, translational research and in nurturing of Biotechnology startup ecosystem. The Minister announced key missions at the foundation day ceremony including Atal JaiAnusandhan Biotech Mission – Undertaking Nationally Relevant Technology Innovation (UNaTI), which is expected to transform Health, Agriculture and Energy sectors during the next 5 years. This mission includes GARBH-ini – A Mission to promote Maternal and Child Health and develop prediction tools for pre-term berth, IndCEPI – A Mission to develop affordable vaccines for endemic diseases, Development of Biofortified and Protein Rich wheat – contributing to POSHAN Abhiyan, Mission on Anti Microbial Resistance for Affordable Diagnostics and Therapeutics and Clean Energy Mission – Innovative Technology interventions for Swachh Bharat. Dr. Harsh Vardhan further informed that the Department has recently established Skill Development Centers at various institutions and also collaborated with State Council of Science and Technology for implementation of Skill Vigyan programme which aims to provide high quality hands on training in tools and techniques in multidisciplinary area of biotechnology for entry level students. On the occasion, the Union Minister also unveiled short film on DBT activities, launched new DBT website and released Coffee Table book. The Science & Technology Minister also highlighted that Discovery research and generation of new knowledge of biological sciences is very important and is fundamental and foundation of innovation and Department’s support to competitive R&D activities in biotechnology has resulted in more than 6000 publications. Secretary, DBT, Dr. Renu Swarup, in her opening address laid impetus on strengthening the research and translation base and ensuring sustainability and scalability. The Secretary highlighted the role of (BIRAC) in promoting and nurturing innovation and entrepreneurship over the years which has resulted in support to more than 500 startups, 35 bioincubators spread across the country. “Approximately 175 IPs have been generated and 140 products and technologies commercialized; besides this, the Department has supported more than 15000 scientists and 5000 skilled research manpower.” said Dr. Swarup. On this occasion, Foundation Day lecture was delivered by Dr. Peter Goodhand, Chief Executive Officer, Global Allliance for Genomics and Health, Canada which was followed by panel discussion on Biotechnology @2025: Our Achievements; Our Aspirations and Young Investigators shared their scientific journey. Former Secretary, Dr. Manju Sharma also delivered a talk on celebrating Biotechnology “Building India as an Innovation Nation.